This unique looking hi-fi amplifier was put together by Matt in a vertical wooden chassis that has been styled after early vacuum tube equipment of the 1920s. The amplifier uses a single 6EM7 tube per channel. The 6EM7 tube has two dissimilar triodes in one envelope. One is a high gain, low power unit intended as an amplifier or oscillator, and the other is a higher power unit originally intended to drive the magnetic deflection coils on the back of a CRT. Together the tube sections are well suited to create a nice little audio amplifier with just one 6EM7 tube per channel. The clean output power from the 6EM7 SET amplifier is 2.2 Watts per channel and the frequency response is consistent with the advertised performance of the Edcor audio output transformer (40Hz to 18kHz). Matt reports that the single-ended 6EM7 amplifier sounds wonderful! Bass is well articulated without being boomy, mid-tones are clear and even, and the highs are crystal clear. The amp has exceptional transient response; reproducing my favorite classical recorder piece ("Frederick The Great : Sonata in B-Flat - Allegro" performed by Michala Petri) with clarity, lightness, and vibrancy. 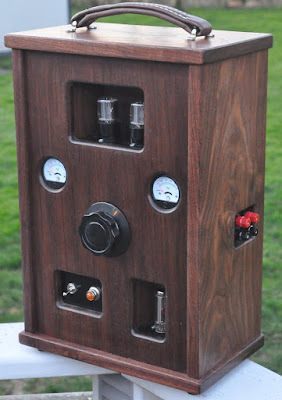 For full details, see the 6EM7 Single-Ended Triode (SET) amplifier project page.